Advertising pack for Cerveza ‘El Gallo’, probably made in Belgium, c.1880. The designs are closely copied from others made in Barcelona around the same period, but the inscriptions on the cards are vague and incomplete, testifying to their anonymous manufacture. 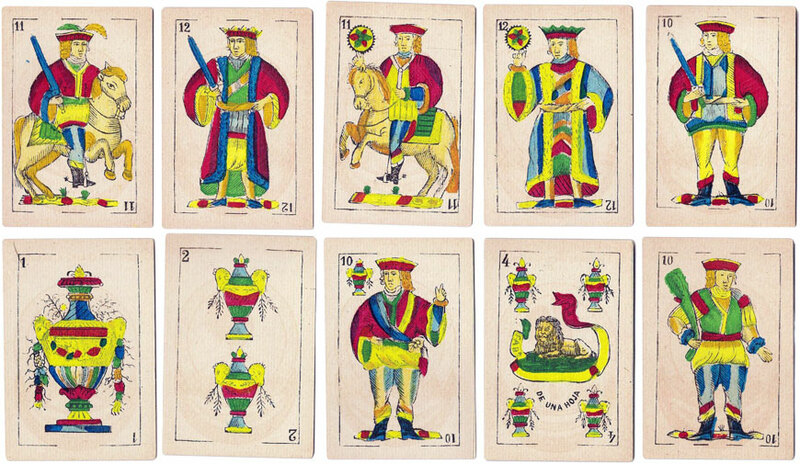 The cards are colourfully hand-painted using stencils, and the cups symbols are attractively adorned with goats' heads. The four of cups carries the lying lion motif, a favourite amongst the Belgian manufacturers, but the inscription on the banderole is incomplete. The reverse of the cards carry an advertisement for Deutsches Export Lagerbier "El Gallo" whose agents in South America are given as Galli y Cia (Montevideo) and Galli Hermanos (Buenos Aires). Above: Advertising pack for Cerveza El Gallo, made in Belgium, c.1880.